As usual, a somewhat mixed bag: Investors are still enthusiastically bidding up the new Irish property REITs to significant premiums, a few junior resource stocks are enjoying some unexpected love (all too briefly, I suspect), while Petroceltic International (PCI:LN) has attracted a possible offer***. 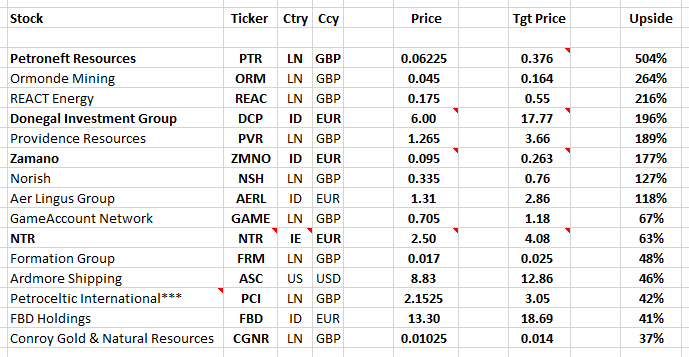 But we also see some unsurprising (and/or consistent) winners – fortunately including two stocks I own, NTR & Zamano (ZMNO:ID). Frankly, despite reading the EGM circular & interim results, this still doesn’t compute. I’m astonished shareholders appear to have accepted & approved this deal (and turn of events) without a single peep of protest. PACC had net assets of EUR 6.1 million at end-Jun 2013, though this nearly halved to 3.3 million by year-end – since then, despite disposal proceeds of 8.0 million, net assets have declined to 1.5 million (similar to the indicated 1.6 million of post-deal cash) in the recent interims. It seems like the buyer of PACC’s cellphone stores business was able to cherry-pick all the good stores/business & reject any crap. Plus it also seems like much of the proceeds are being eaten up dealing with existing (and new?) liabilities & provisions related to this crap (and repaying the outstanding shareholder loan). We should note Fyffes management & shareholders are virtually irrelevant at this point, this is really a slugging match between Chiquita & Cutrale/Safra now. Even Chiquita’s shareholders may be irrelevant, unless they mount a serious legal challenge…we all know of management teams who put themselves ahead of shareholders, unless they’re forced to do the right thing. For the moment, Chiquita management still appears set on completing a merger with Fyffes – hopefully this isn’t simply a desire to protect jobs & expand their empire. Frankly, I’m a little surprised FFY is so perky here. After collapsing to EUR 0.85 in August, on the Cutrale/Safra news, the share price has steadily recovered. But the revised merger agreement of 0.1113 ChiquitaFyffes shares for each Fyffes share suggests FFY should trade even higher. But that ultimately has little to do with the merger, and everything to do with a CQB share price that’s elevated by the current cash bid (and maybe the prospect of another)! I’m not quite sure what investors are anticipating here: i) The merger goes ahead – well, CQB’s pre-cash bid share price was USD 10.06, which would equate to FFY around EUR 0.89, or ii) Cutrale/Safra wins & Fyffes gets jilted at the altar – well, FFY’s pre-Chiquita share price was also (coincidentally) EUR 0.89?! Maybe everybody’s clinging to the idea the merger will go ahead, and the new ChiquitaFyffes share price will magically home in on the curiously precise target of $21.20 per share, by end-2016. [Oh, you didn’t know? See page 20 of this presentation!]. Sure, companies love to tout the synergies of an M&A deal – despite how unreliable those forecasts invariably prove to be – but forecasting a very specific (& substantially higher) share price target, to be attained within a specific time period, is just plain ridiculous & irresponsible..!? But it highlights what management’s prepared to do/promise to see this merger completed. And it could hint at some type of potential scorched earth policy by Chiquita, if necessary, where raising their bid & winning may not be so attractive for Cutrale/Safra anymore. If you have questions about any individual stocks & valuations, just post a comment here or email me. Cheers! Hi Wex I think you are wrong on Ffyfes. There is a merger break fee of €17.8m coming – less expenses. I get higher EBITDA cash conversion anyway close to 69% – but then I would rather use PE than price to sales. Another way to look at FFY is to ask what sort of sustainable dividend / cash return could it pay. Lets look at 2013 we have free cash flow (inc pension etc) of €28m. We have maintenance capex of 7m – say 8m to be conservative – looking at prior years capex. No real debt so FFY could pay a divi of about €20m each year – giving a 7% yield. This is too high given the current low interest rate world we live in. Couple of points, FFY is very asset rich – so it could probably take on debt, secured against the assets then use the FCF to pay the debt and pay shareholders – LBO sort of model. I dont particularly like this way of doing business – I much prefer to buy lowly geared, asset rich companies and let nature take its course…. Hopefully this makes some sort of sense. If you are interested more on my blog. – That break fee is nice, but a lump sum of cash tends to get discounted unless they return it, or specifically invest it for a high return – for example, an acquisition. – My additional debt capacity/adjustment may seem conservative, but reflects the cashflow shortfalls I’ve highlighted, and also existing debt & interest expense. – Yes, cashflow has improved recently, but I wouldn’t be convinced yet. It’s also far more volatile than the P&L, so averaging this cash shortfall over the last few years & pricing/adjusting my valuation accordingly continues to make sense – albeit with room for improvement, if we see a sustained cashflow trend. – Fyffes is Total Produce’s more exciting twin – it’s certainly far more capable of delivering an unexpected earnings growth. But it’s also a more volatile business (not to mention the cashflow aspect) – so I don’t disagree with your numbers, but your implied P/E of about 13.5 doesn’t necessarily look cheap (or expensive either). – I think TOT is more suited to such a strategy, and I’ve detailed it accordingly – but yes, there’s scope with FFY to do some kind of LBO-strategy: That is, to maximise debt (within prudent limits) & cashflow, and focus on returning cash to shareholder via share tenders/buybacks. Hi Wexboy – first of all I am greateful for all the useful and detailed work you are doing on this blog. I have recently developed an interest in active investment and the amount of data and information out there to absorb is quite challenging. I have a question for you given my “new” background to this – what are your preferred methods for stock valuation and what benchmarks you use. So for example P/E – Shillers advocates a P/E of 16. Investopedia says 15/20. I would be interested to hear your take on this. Thanks in advance! I try to use as many valuation approaches & metrics as possible, really. The more they confirm each other, the better – and the more divergent they are, the greater the need to investigate further. [Which could turn out to be positive, or negative – divergent valuations can spell risk, or opportunity]. I’m not a huge fan of P/E ratios myself – at best, it’s a rather blunt valuation tool, and at worst, it can be downright dangerous. If I was using a P/E ratio, I’d normally use a 1.0 PEG ratio as a rough rule of thumb – i.e. the P/E ratio should perhaps equal the earnings growth rate. I tend to find the Price/Sales ratio a far more useful & robust valuation approach – it’s less volatile, far less prone to manipulation, and it better approximates how corporate/PE acquirers value companies. See the comments below, and elsewhere, for more detailed P/S commentary. Thanks Wex, I’ve been back to that post many times in the past to read up on precisely that part but I think you’ve just cleared it up for me – higher margins deserve higher multiples so below a generalised 10-12% for 1.0, the inverse is true – and with that you used the more conservative Op. FCF for the already conservative P/S valuation. I always enjoy reading your posts because they always show something new and your way of valuing things on here is always a great way to see our own blind spots and check against our own techniques – thanks again! Yes, good perspective – my P/S multiple tends to compress below a 10-12.5% operating margin, but expands with higher margins. You’ll note P/E ratios exhibit a similar pattern – a 1.0 PEG ratio’s a useful rule of thumb, but a 30% earnings growth rate will probably attract a much higher (expanded) P/E ratio. [Though obviously there’s a lower limit to this relationship – stable earnings (i.e. zero earnings growth) probably still deserve at least an 8-10 P/E]. Hi Wex, another interesting post as always, thanks. I’ve been following the valuation techniques explain here on the site for a while now – the one on Fyffes got me wondering though. You get to a P/S ratio of .1875 which I appreciate is penalising an adjusted margin for lack of cash conversion – since four decimal places is a bit much for anyone from a finger in the air and the fact it’s an adjustment of 12%, would you be able to talk us through your thinking of the cut from 2.1 to 1.875? If I’d relied on solely a P/S-type valuation here, I might well have used an average of Fyffes’ 3.8% EBITA margin & its (average) 2.1% Op FCF margin. But I’m also using a P/E multiple here, which already reflects the higher EBITA margin – to compensate, I’ll stick with the more conservative 2.1% Op FCF margin for my P/S valuation. Assuming an 11% margin equates (on average – as per my note above) to a 1.0 P/S multiple, you’d therefore expect to see something like a 0.19 P/S multiple. But I often have an irrational** habit of expressing decimals in terms of the nearest sixteenth – so 3/16 equals 0.1875! ** But grounded in a certain logic: Most interbank interest rates & trading were originally expressed in sixteenths (for example, ‘I’m quoting 4 5/16-3/16 in the 3 mths’), and even in thirty-secondths as the amounts got larger. [These days, most quotes are totally decimalised]. Years later, I can still repeat every 32nd to five places of decimal with my eyes closed…so they’re inevitably the ‘patterns’ I see buried in every decimal I look at!